The magazine Vertical Floor was created by students in Newhouse’s magazine, newspaper and online journalism master’s program. The students of the magazine, newspaper and online journalism master’s program dove headlong into niche publications with their 2013 capstone experience. 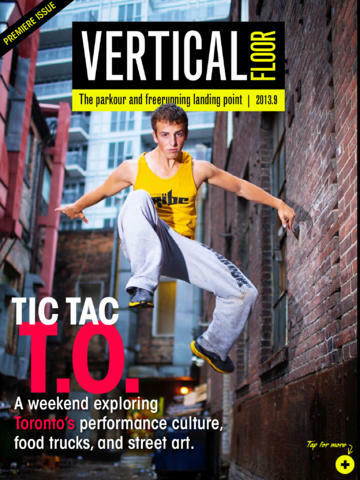 The launch issue of tablet magazine Vertical Floor explored the vibrant culture of parkour and freerunning, attempting to become the definitive guide and resource for practitioners and admirers alike. Industry insiders helped choose the magazine’s topic through the inaugural Newhouse Tablet Competition. A pool of nine teams pitched ideas, and the professionals picked the winner. Thanks to parkour’s inherent visual appeal, the judges also felt the idea took advantage of the tablet’s ability to showcase video and to provide mobile interactivity. Eschewing a traditional magazine format, content was divided into six verticals, ranging from technique and nutrition to pop culture and news. One feature examined parkour’s growing international presence, and included sources from Nepal, India and Venezuela. Another looked into physical education programs in New York City that implement parkour into their curriculum as an innovative solution for funding cuts. The centerpiece of the issue was the city guide, or “Scene” vertical, a recurring element to be featured in potential subsequent editions. Vertical Floor sent a team to Toronto to explore its burgeoning parkour and freerunning community. The team highlighted other aspects of the city of interest to readers, including food, art and cultural attractions. In six weeks, the Vertical Floor team of 28 students and three faculty instructors produced more than 30 pieces in various formats, from traditional text narratives to interactive timelines, videos and 360-degree photo galleries. Students pitched, researched, produced, edited and fact-checked each story themselves, and also designed VerticalFloorMag.com, which republished all content from the tablet edition as well as several web exclusives. Social media editors also developed an international audience on Facebook and Twitter; during production, potential readers engaged with the Vertical Floor staff through discussions and contests. The launch issue of Vertical Floor is available for free download at the Apple App Store.